• Available in 1 gallon & 2.5 gallon. • To Control Susceptible Broadleaf Weeds In Cereal Grains, Corn, Sorghum, Rice, Sugarcane, Soybeans (Preplant only), Turf, Non-Crop Areas, And Certain Aquatic Applications. • Treats more acres than any other premium 3-way broadleaf herbicide. 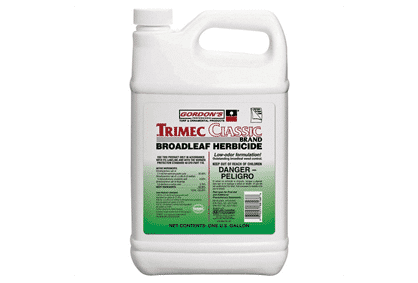 Trimec Classic delivers proven control of more than 90 broadleaf weeds, including clover, dandelion, plantain, and chickweed. The synergistic action of its formulation helps keep the cost-per-acre low, and Trimec Classic won?t harm most turfgrass species when used as directed. • A systemic glyphosate IPA with a proprietary surfactant included for enhanced plant absorption. 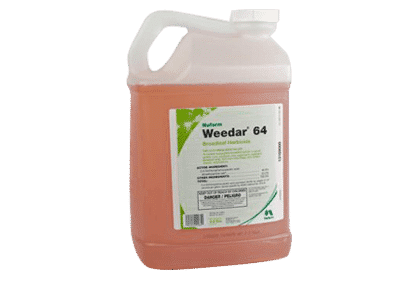 This product offers growers and dealers the same control as the leading glyphosate / surfactant offering while providing a broader label and reduced price. 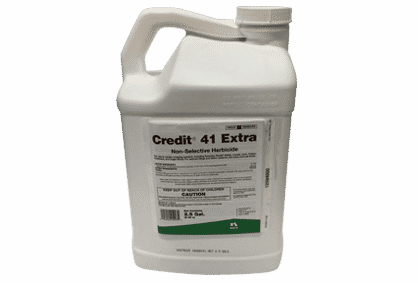 Credit 41 Extra is intended for use in row crops such as corn and soybeans as well as chem-fallow and reduced tillage markets. 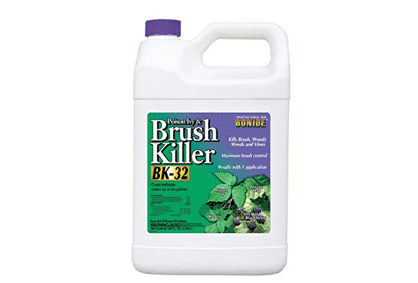 • A non-selective post-emergent herbicide that targets woody plants and brush such as blackberries and poison oak, as well as annual and perennial broadleaves, while leaving grasses unharmed. 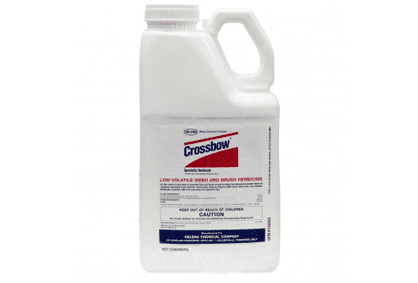 Crossbow achieves excellent control of woody plants and brush and can be applied by all types of sprayers, from hand-held models to tractor-mounted spray rigs. Except for lactating dairy animals there are no grazing restrictions following the application of Crossbow Herbicide. Crossbow is rainfast within two hours after application. 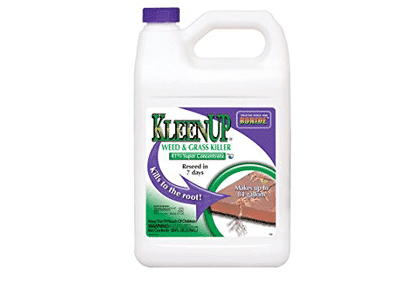 • This powerful, non-volatile formulation works on over 70 of the toughest weed species, yet is harm-less to grass. • Can be applied as a foliar spray to the leaves & stems, as a spot treatment or as a stump treatment. • Contact and systemic action. 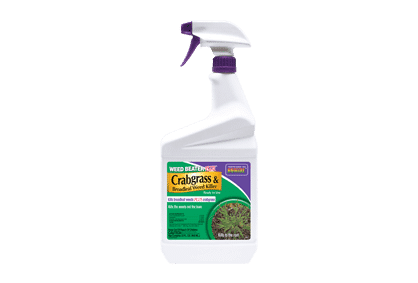 Kills grassy and broadleaf weeds like crabgrass, clover, chickweed, oxalis, dollarweed, spurge, foxtail and over 200 others. Not recommended for St. Augustine or Centipede grass type turf. Combines Quinclorac, 2,4-D and Dicamba for complete post emergent weed control, right down to the roots! 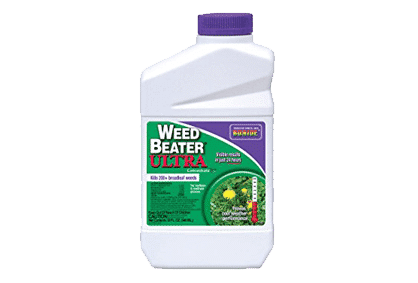 • The ultimate systemic broadleaf weed killer for lawn and turf. New chemistry that’s especially effective on over 200 hard to kill weeds, right to the roots. Visible results in just 24 hours! Rain fast once dry. Reseed in just 2 weeks! Superior cool weather performance down to 45°F extends application window to early spring and to late fall, when weeds are most susceptible. Non 2, 4-D formula contains MCPA, Mecoprop-p, Dicamba and Carfentrazone. Pint concentrate treats > 21,000 sq. ft. So., > 10,000 sq. ft. No.